Variations in size and fabric are available. Please inquire for futher details. Offered is a custom-made Lucite piano bench with upholstered seat and reinforced with a lower cross stretcher. The bench can be used as a vanity bench or stool. 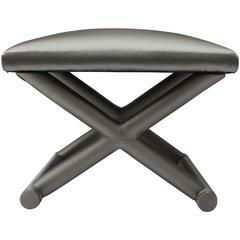 X-bench stool in new grey satin upholstery. Newly upholstered bench with lucite waterfall legs......fabric is a printed linen from Michael Smith. 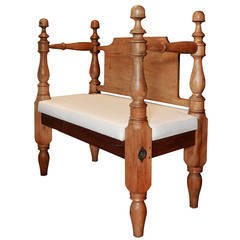 Customized from an Antique New England "Rope Bed". Upholstered seat cushion with muslin material. A wonderfully elegant and simple design. Custom sizes are available. Exquisite Postmodern custom upholstered waterfall form bench, circa 1960s-1970s. This stunning bench has been newly upholstered in a celadon cotton/wool blend quilted fabric.